Aug. 11, 2017 3:30 p.m.
Members of the media were invited for an early look inside Red Deer College’s newest facility, the Gary W. Harris Canada Games Centre/Centre des Jeux du Canada Gary W. Harris. With being just a year away from cutting the ribbon, the facility will offer many features including teaching and learning spaces, a performance gymnasium, fitness and training space, Olympic-sized ice surface and so much more. The facility will also be an important venue during the 2019 Canada Winter Games with five competition sports taking place including short track speed skating, wheelchair basketball, badminton, figure skating and squash. Site work and preparations for the new facility began in October 2015, with above-ground construction beginning in July 2016. Joel Ward, president and CEO of Red Deer College, said the team is excited to be on time and on budget. “When we first looked at this and we went out to tender, we thought the price was going to come in quite a bit higher than it actually did come in. I think the timing was right and the economy had just taken a turn for the worst. Lots of folks were very interested and more than anything else, we were delighted to get Clark (Builders) who we worked with before, a strong Alberta company out of Edmonton and then our local company Scott Builders who partnered with them and then the local office of Stantec as the architect,” said Ward. He said the $88 million project had to be visually pleasing, and it had to be the new marker for the entrance to the City. 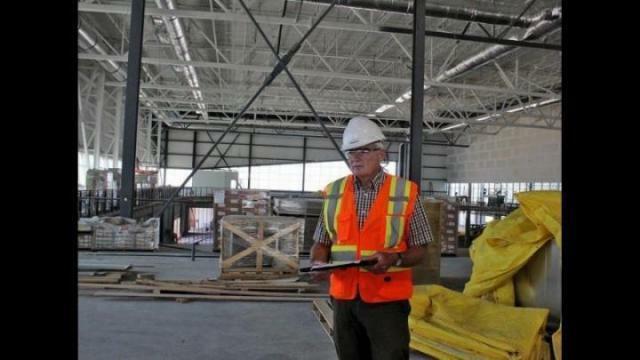 “Given the new work that’s being done on the highway and that we’re no longer just Gasoline Alley when people come to Red Deer, they’re going to see this facility and that’s what’s really going to have people talking,” he said. Ward said most of the sub contractors and workers on this project are all from Central Alberta. “It really made a difference to the economy,” he said, adding that over 2,000 people will be working on the campus over the course of the construction period. Leading the tour on Aug. 11th was Doug Sharp, director of capital projects. Sharp said they intentionally positioned the building on the west edge of the campus with the intent of doing the infill over time. “Our next infill building will be a linear building that will link between here and our existing campus, so our goal is to ultimately have an all weather campus. But there will be a gap between now and then where there will be an outdoor connection,” he said. This will be the first building on the College’s campus that isn’t currently connected to everything else. Ward said when looking at their athletic facilities, they were worse than most high schools, and thought something had to be done. “Our teams get national championships on a regular basis, but we could never even host nationals, but it had to be more than that. It had to be teaching and learning space, it had to be connected to the community. We want the community on our campus and we invite them into this facility and we want it to be a showcase for the College,” said Ward. Ward said the facility is an iconic design unlike anything one will see in any post secondary institution. The completion of the building is set for the summer of 2018, with classes ready to commence September of that year.